The effect of Intralipid on the natural killer (NK) cell activity of healthy male Fisher 344 adult rats was investigated. They were cannulated via the right jugular vein and continuously infused for five days with: normal saline plus heparin, 5% Intralipid plus heparin, or 10% Intralipid plus heparin. Control groups comprised of cannulated rats receiving no infusion and rats undergoing no operative procedures. Following the five-day infusion, rats were exsanguinated under ether anesthesia and mononuclear cells (MNC) harvested from the peripheral blood. NK activity was measured in a standard four hour 51Cr release assay against YAC-1 target cells. NK cell activity in rats infused with 5% Intralipid did not differ significantly from rats in both control groups or rats infused with saline. Infusion of rats with 10% Intralipid resulted in a significant increase in NK activity compared with all other groups. The purpose of this study was to compare the ability of intravenous immunoglobulin (IVIg), intralipid and soluble human leukocyte antigen (sHLA)-G to suppress natural killer (NK) cell cytotoxicity in an in vitro assay. Blood samples taken from 275 women experiencing reproductive failure were analyzed for NK cytotoxicity and the suppression of NK cytotoxicity by IVIg), intralipid and sHLA-G.
Intravenous immunoglobulin, intralipid and sHLA-G suppressed NK cell cytotoxicity with equal efficacy in an in vitro assay. IVIg suppressed by 38.9%, intralipid suppressed by 39% and sHLA-G suppressed by 39%. To evaluate the efficacy of passive immunotherapy in preventing miscarriage. Studies both pro and con concerning intravenous immunoglobulin therapy (IVIG) in preventing miscarriage were evaluated. A new therapy of i.v. intralipid infusion is also reviewed. Intravenous immunoglobulin therapy may be effective but it is necessary to use it prior to conception and monthly thereafter. Some brands are more potent than others. The data concerning intralipid i.v. infusion involves only small case series but the results from one study were encouraging though we could not personally substantiate these findings. 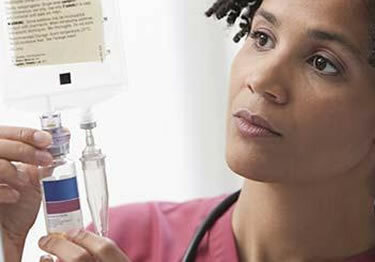 Intravenous immunoglobulin (IVIG) therapy is very expensive. In the author's opinion there are no immunological studies that can determine if a woman needs immune suppression. The best way to decide is the history--the more miscarriages without any other identifiable cause the more likely passive immunotherapy may be helpful. If intralipid proves as efficacious as IVIG it will be a lot less expensive. Roussev RG, Acacio B, Ng SC, Coulam CB, Am J Reprod Immunol - 2008 Sep;60(3):258-63. In vitro investigations have revealed the ability of intralipids to suppress natural killer (NK) cytotoxicity. Evidence from both animal and human studies suggests that intralipid administered intravenously may enhance implantation and maintenance of pregnancy when the patient has an abnormal NK cell level or function. The aim of this study was to establish the duration and efficacy of Intralipids suppressive effect on NK cell functional activity. Fifty women with abnormal NK-testing received intralipid infusions. 39 (78%) showed NK suppression within the normal range the first week after infusion, 11 (22%), showed suppression, but still above the normal threshold. They received second infusion 2-3 weeks later. In 10, the NK activity was normalized the following week. Four patients had three intralipid infusions in 2-week periods in between and after the third infusion, and all showed NKa normal activity. In 47 patients the suppressive effect of the Intralipid after the normalization of NK lasted between 6 and 9 weeks, in two patients this benefit lasted 5 weeks, and in one patient the effect was 4 weeks.